I have a confession – the whole Nordic Noir, Scandi crime thing has passed me by. The only thing I’ve ever read which would qualify was The Girl with the Dragon Tattoo. I’ve never read a Jo Nesbo, Henning Mankell or Arne Dahl. I’ve never watched a single episode of The Bridge or The Killing. I kept seeing fabulous reviews of Snowblind though (translated so well by Quentin Bates) and the sequel Nightblind by Ragnar Jonasson so when I heard there was a third book due out and that he was coming to the Edinburgh Book Festival, I thought now was the time to try some Nordic Noir. And I thoroughly enjoyed it. Ari Thor Arason has taken up his first position as a police officer in the quiet northern fishing town of Siglufjorour. It’s a place where nothing much ever happens, everyone knows everyone else and no-one even bothers to lock the doors. So when a renowned author dies in a fall at the theatre then soon after a young woman is found seriously injured, bleeding in the snow, the whole community is in shock. Ari Thor’s boss Tomas thinks the writer’s death is an accident, Ari Thor isn’t so sure. As he starts investigating both incidents, it becomes clear that many of the townspeople have secrets they are keeping and perhaps there are more connections than first thought between the incidents. I enjoyed reading about Ari Thor as he carried out his investigations. He put me in mind of Hercule Poirot, albeit a younger and more handsome version (at least in my mind!). This was a case of good old fashioned detective work with Ari Thor doggedly working his way through the evidence and systematically interviewing all the witnesses, beginning to come to conclusions. There were lots of clues leading the reader develop their suspicions about what had happened and who was responsible. What Ragnar Jonasson has done brilliantly in this book is bring the town of Siglufjorour to life – even if I have no idea how to pronounce it! I was reading this over Midsummer, with light in the sky past eleven at night, yet I could sense the darkness and chill of the Icelandic winter. The oppressiveness of the snow and cold was ever present and the feeling of the claustrophobia, especially when the town was cut off by an avalanche, was almost tangible. Snowblind was a steady paced novel with a very likeable protagonist who I’m sure I will enjoy getting to know more in the other Dark Iceland novels. I’m looking forward to reading Nightblind and the soon to be released Blackout, the third in the Dark Iceland series. And I’m very much looking forward to hearing Ragnar Jonasson at the Edinburgh Book Festival in August. Siglufjorour: an idyllically quiet fishing village in Northern Iceland, where no one locks their doors – accessible only via a small mountain tunnel. Ari Thor Arason: a rookie policeman on his first posting, far from his girlfriend in Reykjavik – with a past that he’s unable to leave behind. When a young woman is found lying half-naked in the snow, bleeding and unconscious, and a highly esteemed, elderly writer falls to his death in the local theatre, Ari is dragged straight into the heart of a community where he can trust no one, and secrets and lies are a way of life. An avalanche and unremitting snowstorms close the mountain pass, and the 24-hour darkness threatens to push Ari over the edge, as curtains begin to twitch, and his investigation becomes increasingly complex, chilling and personal. Past plays tag with the present and the claustrophobic tension mounts, while Ari is thrust ever deeper into his own darkness – blinded by snow, and with a killer on the loose. 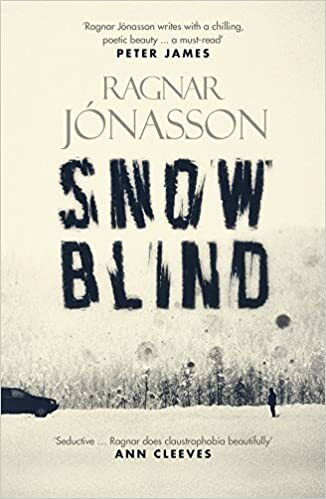 Taut and terrifying, Snowblind is a startling debut from an extraordinary new talent, taking Nordic Noir to soaring new heights. I think we’re twins separated at birth Joanne! I could have written that first paragraph myself!